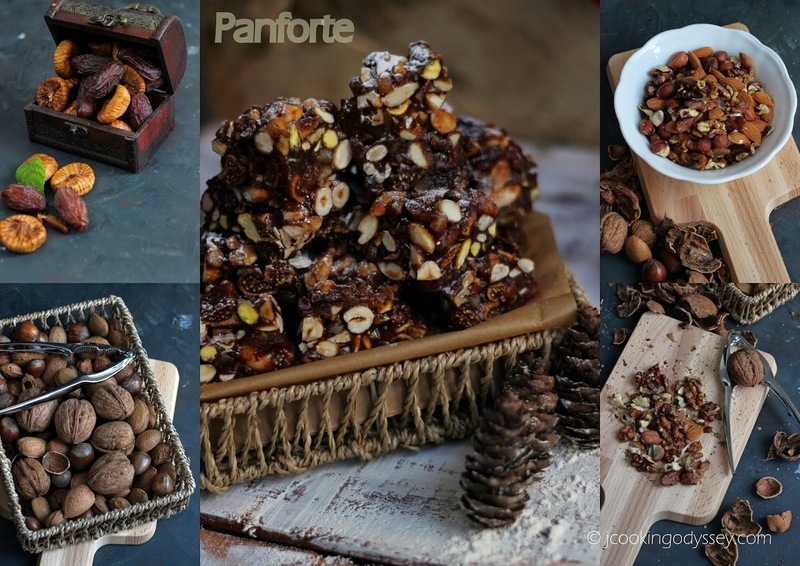 Jagruti's Cooking Odyssey: Panforte chocolate - Italian Christmas Honey Fruitcake ! Panforte chocolate - Italian Christmas Honey Fruitcake ! "The Magic of Christmas season" is in full swing, one of the great opportunities we have these days is to savor the Christmas season. Christmas is not a single day; it's a season ! Just everything around Christmas, is wonderful and marvellous, only maybe the weather tries to dampen your mood, but all the joy and excitement never let Christmas season be dulled. Christmas lights, holly wreaths, carollers, ice skating, festive dining—it’s an exciting time of the year for us. Tens of thousands of coloured lights combine with evergreen swags and wreaths of holly and winter berries to line walkways and festoon lamp posts, these are the scene of the magical Christmas. Christmas is the busiest and most interesting time for everyone, towns are buzzing with shoppers and most of the places would be teeming with shoppers ceaselessly thronging the passages between the shops. This year we witnessed shopping madness on Black Friday. The Markets and shopping centres are decked with glittering lights, shiny tinsels and traditional decorations. All add to the Christmas atmosphere. Walk in the store and hear Christmas music playing, buying gifts and presents and wrapping them brings great joy. The Christmas season is one of sheer bliss, warmth and kindness penetrates. The excited smiles of the children warm the frosty air. The magic of the season brings people together from corners of the globe. Christmas is not only a time for excitement, but also one for serenity. Christmas is like the last crackling embers of a fire as the year draws to a close. Christmas cooking I think is just as important as spending quality family time together . Baking some festive cookies ,pies and cakes are an important part of the celebration. Also cooking with kids is also enormous fun ,it can be long and messy task but you can't beat 'gastronomic delights' on the Christmas table and a cooking up a memories to last a lifetime ! Both kids are at home for the Christmas holiday and it is a right time to spend some quality time with them, that could be anywhere, watch TV together, play some games or maybe bake few goodies in a kitchen. So this holiday season we have taken inspiration from Italy and it's Panforte - Italian Christmas Honey Fruitcake ! This confection, which is bursting with dried fruit and nuts has been made in the Tuscan city of Siena since the Middle Ages. Although it does have similarities to the ' British Fruitcake' but this traditional Christmas treat is sticky and chewy and it is served after a meal with coffee or dessert wine. However I have added few ingredients extra and made a chocolate version of Panforte, which is an irresistible Christmas treat around the world !! Preheat oven to gas mark 3 or 160c/140 Fan. Line a baking cake tin with baking paper. Put the hazelnuts on one tray and all the other nuts on another. Roast them for 6-8 minutes and let it cool a little. Rub off the hazelnuts peppery skins off using clean kitchen towel. Roughly chop all the nuts and leave it aside. Cut the figs and dates in a very small chunks and mix with the chopped nuts and mixed peel. Mix together the flour, cocoa powder, ground spices then stir into the fruit and nut mixture. Put the honey, sugar and butter in a pan and heat slowly, stirring until all the butter melts and the sugar has dissolved. Simmer the syrup for another 2-3 minutes or if you have sugar thermometer boil to the mark 240 F or 115C. Pour over the flour mixture and mix fast and well. Pour the mixture into baking tin and bake for 40 minutes. Leave it to cool completely. Dust with the icing sugar and cut into squares. Enjoy with coffee or dessert wine. This sounds amazing Jagruti. Thanks for the lovely share!